In the wake of the cancellation of Roseanne, ABC has been doing everything in their power to resurrect it. Their latest attempt: a spinoff featuring Darlene. Variety reports that Sara Gilbert and the executive producers of the currently deceased show met with Channing Dungey this past Monday and presented her with an idea for a spinoff featuring Darlene. John Goodman and Laurie Metcalf would be willing to join said spinoff, as would the now-unemployed. Because the show was renewed for a second season, an approved spinoff could go into production immediately and be ready to go possibly by late November—maybe just in time for Thanksgiving, so viewers can spend time with a casually racist family that is not their own. Please take this with a grain of salt: Radar reports that Barr is reportedly “livid” over this development and believes that the show will “fail miserably” without her presence. 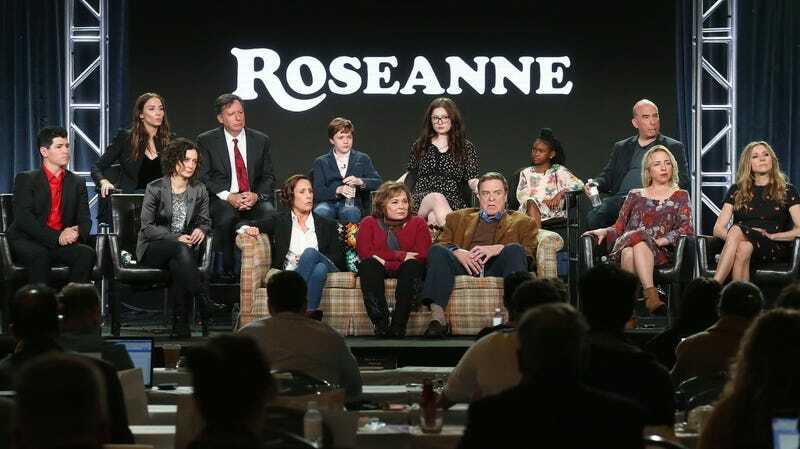 Truly, it seems all the stars are aligned for some form of this program to return—but there is still the issue of Roseanne Barr, the star of Roseanne, who is the reason the show got cancelled in the first place. As she’s the creator of the character Roseanne Connor, she’d have some financial stake in any spin-off, which is a situation that ABC doesn’t want to support. The very same curiosity that drove viewers to watch the reboot in the first place will likely draw them back to a spin-off featuring Darlene, which is clearly what the networks and producers are banking on, ever since their money source, a racist Twitter troll, flew a little too close to the sun.